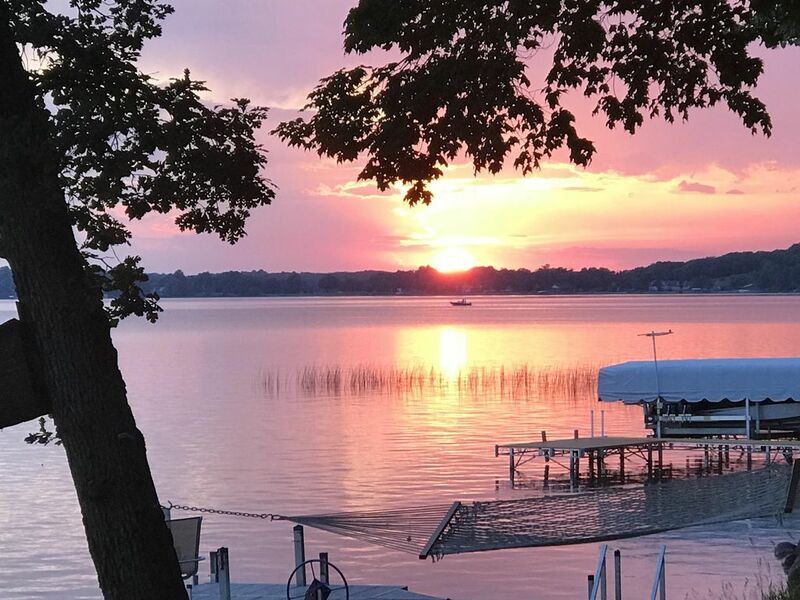 Crystal Lake is a great swimming and 100' lake frontage with fabulous sunset views! A cute and cozy cabin, with a main floor bedroom (sleeps 2) and bath, plus a loft with 2 sleeping areas (sleeps 6). Fully functional kitchen with an oven, range, microwave and fridge/freezer. Covered outdoor eating area and a grill. Wood cathedral ceiling, gas free standing fireplace, and open plan create a space for making wonderful memories. Covered deck, plus 2nd deck and patio for nice outdoor living areas. Beautiful large level lot area at lakeside. All tar access. Window air conditioner and fans available. NO SMOKING ON OR NEAR THE PROPERTY. Sorry, no pets allowed. A good lake for fishing (walleye, muskie, crappie, pike) from the dock or on a your own boat. Plenty of fun is available to be had with 2 kayaks, yard games, board games, walking, hiking, fishing and more! Water shoes are recommended! Property only 1 hour from Fargo/Moorhead available to accommodate up to 8. The cabin is located in the Heart of Lakes Country! So much to do within miles - Maplewood State Park, Golfing and many excellent restaurants! Guests provide their own meals. The kitchen is fully equipped with dishes, coffee maker, toaster, pots, pans, glassware. There is a large propane grill for your use. You will have access to part of the pantry and most of the fridge and freezer for your food. Plan on bringing coolers to help with the beverages though! Pillows, sheets and bath towels are provided. You will want to bring beach towels. Enjoy a family campfire down by the lake with the fire pit, adirondack chairs and roasting sticks for s'mores! FIREWOOD PROVIDED! Upon checkout we ask you strip the beds and put all used sheets and towels on bathroom floor. Remove food from fridge, freezer and cupboards. Place trash in garbage can outside. This property is not handicap accessible and is not recommended for older people who struggle with steps or inclines. Space for 2 vehicles comfortably. Inside dining area sits 4. (One extra chair in master bedroom.) 2 outside dining areas - one covered, one on patio - sits 6 total. A variety of books your use. Lots for great family games available for your use! Spent a very relaxing week at the lake front. Reading, visiting, kayaking and a little fishing. Nice house on the lake with a beautiful lake front yard. Spent every night by the fire and just soaking in some rest and recovery. Quiet. Nice walking on the roadway with almost no traffic. Walked 3 miles every morning. House had everything that we needed and we would recommend staying here to anyone looking for some quiet, down time. Just what we needed. Fully modern with great traditional Lake cabin fell. Clean and organized. Very quiet, non-existent traffic. The predominate SW wind is lovely. We look to returning. Cozy, cute and clean! This was a great choice! We stayed here mainly to attend We Fest but also got to relax by the water! Perfect location with so much to do! Had every thing we needed for our big family. So relaxing and also so much fun stuff to do for adults and kids. Amazing communication with the owners and personal touches that were very welcoming. Highly recommend. What an unbelievable piece of property you have. The Cabin was clean and you left wonderful touches with the s'mores materials and the welcome sign. The lake was fantastic and weather perfect. We enjoyed fishing daily, the kayaks and of course the fires at night. Hope you do not mind, left you a couple of good fishing poles and some tackle from our adventures as well I left you a couple of cozies with my company logo on them. Enjoy and hope to utilize your property again next year. It was a perfect week. This was a wonderful cabin on a beautiful lake! There were lots of things to keep my family busy, and we had a great time!